It’s hard to believe but my Cascade came from a cutting. It was no more than a twig that was a few inches long. I clipped it from a plant in my friend’s mother-in-law’s backyard during one of their famous Summer barbecue and pool parties. I didn’t know a whole lot about home brewing back then, but if I could brew with something I grew myself, I thought it might be worth trying. I went to a show at the San Francisco Conservatory of Flowers that was based on Amy Stewart’s book Wicked Plants . The show was called “Wicked Plants: Botanical Rogues & Assassins“.There was a hop plant in the show. I was enthralled. The show had a very Victorian aesthetic with lots of black iron and references to death all around, not to mention the building itself . Though hops are only “wicked” in the sense that they’re related to cannabis. The flowers can be used as a mild sedative. Anyway, the show gave me a lot of ideas and plans for my plant. It’s power and mystery was just unfolding. The first year the plant was just trying to grow roots and survive. At a certain point I took it off my kitchen windowsill and put it outside to see how it would do. I was surprised. In the second year it grew a few bines that were able to work their way up some bamboo poles. It grew to about four feet tall. I was happy, but not impressed. It tried really hard to produce a few cones. I harvested a handful. I wasn’t sure what to do with them. Make a pot of tea? Not as cool as a batch of beer. They’re still in my freezer. 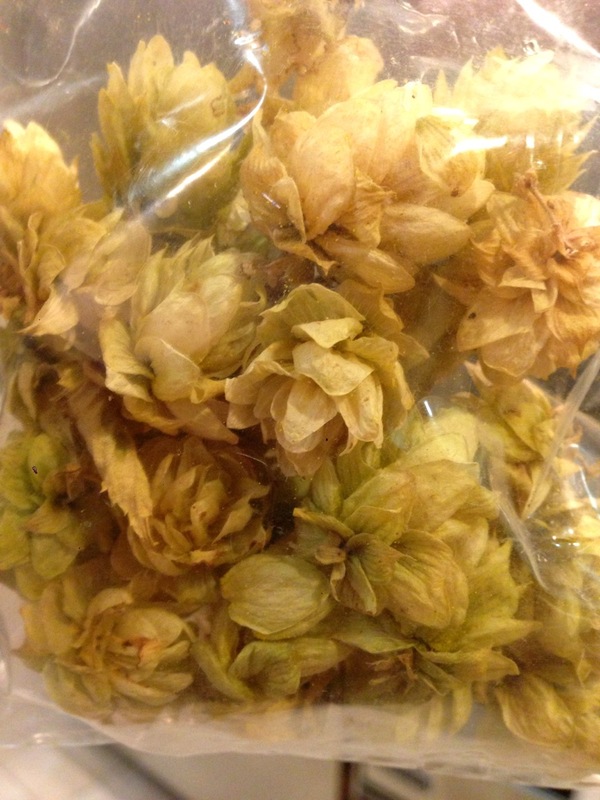 Tiny hops bines earlier this Spring, still in a container. Then something happened…. I met K. Ruby Blume, founder and head instructor of the Institute of Urban Homesteading. She didn’t waste any time. As soon as I told her my hop plant was in a container, she told me to put them in the ground. These plants have roots that are thick and long and have evolved to drill down deep into the Earth to get nutrients. I took my plant out of its container. And I was shocked. Its roots were massive! We have a side yard that is overgrown with weeds. The fence is pretty plain and boring to look at. My plan is to put a trellis on the fence and let the plant go wild. I want it grow parallel with the ground and cover as much of the fence as possible. I picked a spot and started digging. I added some compost and a bit of dirt filled with nutrients that I bought at East Bay Nursery. I also put up a wire fence around it to keep the chickens away while it’s growing. They’d love to peck at its little leaves because they’re so tasty when they’re young. Then I watered it and watched as it grew and grew. 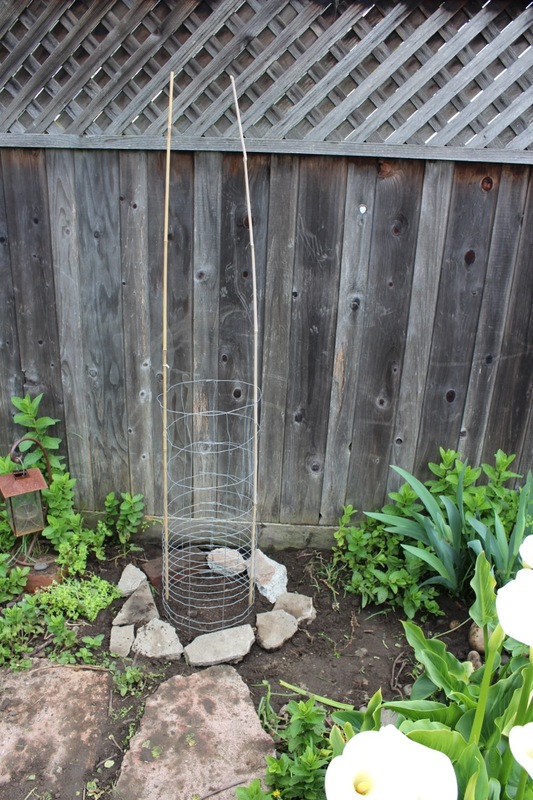 I put in six bamboo poles for the plant to climb. I roughened them up with some sand paper to give the plant a good grip. My plan is to tie string at then ends of the poles and lead them to the trellis, though they might find the trellis on their own. So far the difference has been huge. The plant is thriving, active, and growing quickly. I’m expecting to have at least two bines wind their way up per pole. That’s twelve bines! Of course, I couldn’t help myself now. I picked two more spots in the yard and planted Columbus and Mt. Hood. I bought the Columbus online from More Beer. I had to pre-order and wait a few weeks. I planted it on the other side of the fence, about fifteen feet away from the Cascade. Together they might cover the whole fence! And then a member at the last Bay Area Mashers meeting brought a whole bunch of Mt. Hood rhizomes to share. I grabbed one! I planted these next to our chicken coop. I want to train the bines to go up and over the chicken run to provide shade. Apparently, hops are beneficial for chickens, from what I read on the Interwebs. I’ll post a picture later when they start climbing. Who is K. Ruby Blume? K. Ruby Blume is the founder and head instructor at the Institute of Urban Homesteading (IUH). She’s also co-author of the book Urban Homesteading: Heirloom Skills for Sustainable Living . She describes herself as an educator, gardener, beekeeper, artist, performer and activist, with 20+ years experience gardening in an urban setting. And what’s the Institute of Urban Homesteading? The IUH is an amazing local resource for knowledge and a way to get hands-on experience in urban gardening like growing vegetables and fruit, mushroom cultivation, permaculture; animal husbandry like keeping chickens, bees, goats, and rabbits; urban farm kitchen skills like making cheese, fermenting, brewing, foraging; and more like cooking with solar ovens, aquaponics, sewing, natural dyeing with local plants, and so much more… Whew! The Institute of Urban Homesteading is a response to current interest in food security, localization and self-determination. We are riding the wave of a massive global movement to change our relationship to food and resources. Necessary components of this movement are small-scale person-to-person, person-to-land based projects. IUH seeks to fill this need and to model sustainable, local direct-action through education. We intend to conserve both personal and global resources by staying home and tending the garden. Some more photos of K. Ruby Blume’s Cascade hop plant, climbing ropes up to her second story deck and finally up a pole mounted on her roof! And The Story Continues… with a Workshop! I’ve booked a date with Ruby to teach the first class I’m offering in a series of homebrewing classes. She’ll be teaching a three hour workshop, tentatively called, “Organic Gardening for Homebrewers”. She’ll not only show you how to grow, harvest, and store hops, but she’ll also show you how to grow all sorts of brewing herbs and other goodies in your backyard. She’ll also have a homebrewer there to talk more about brewing with your own fresh hops. The class is scheduled for September 14th. If you want to be notified when we open up registration for the class or find out about other classes, sign up for the newsletter. Above are some photos from May 4, 2013. My Cascade is climbing high! They’re probably more than three feet off the ground. …I think I need to cut back on the watering. I just found out that overwatering is worse than underwatering. I just met Ruby for the first time – isn’t she great? She told me the same thing as soon as she saw the potted hops plant on my front porch. Your hops look fantastic. Mine are just starting to take off: http://www.plantandplate.com/plants/hops-humulus-lupulus/ Are you growing other brewing herbs? Beautiful blog, Claire! Thanks for posting the link. I’m looking forward to seeing your trellis full of hops later this Summer or Fall. I’m hoping to start growing herbs specifically for brewing. I just discovered the book “The Homebrewer’s Garden”. It has all sorts of good stuff in it. I have a brew in my basement right now that use has figs and meyer lemon leaves. It’s my first brew with additions from my garden. I’ll be blogging about the results in a few weeks. 😉 Cheers! I have The Homebrewer’s Garden on my desk right now — loan from a homebrewer friend. Figs & meyer lemon leaves, hm? I have both growing in the yard; somehow never heard of using lemon leaves in anything, though of course it makes sense… Is that recipe in the homebrewer’s garden? If not, care to share?